The next year in 2010, Germany set ambitious targets to have 80 per cent share of renewable energy in the total electricity mix by 2050; to reduce power consumption by 25 per cent below the 2008 level by 2050; to reduce primary energy consumption by 50 per cent below 2008 levels; and to have a carbon-neutral economy by 2050. Schleswig-Holstein is the northernmost of the 16 states of Germany. Nestled between the North Sea to the west and the Baltic Sea to the east and bordering Denmark in the North, it is one of the windiest states of Germany. Travelling from Hamburg on train, as one approaches Husum, one of its main cities, as far as one can see the horizon is spiked with wind turbines. Fittingly, the world’s most important wind energy trade fair is held every two years in Husum. Schleswig-Holstein has close to 3,300 megawatt (MW) of wind power (about 11 per cent of the total wind power installed in Germany) and wind energy provides nearly half the state’s electricity consumption. With more than 200 kW of capacity per square kilometre, it has the highest density of wind turbines in Europe. Wind turbines currently occupy 0.8 per cent of the land in the state. Recently, the state Cabinet doubled the land area that can be used for wind turbines. The state has set a target to develop 4,800 MW of onshore wind capacity by 2015 and 6,500 MW by 2020. To understand the wind power development in the state, we travelled to Ellhöft. This is a small village just 500 m from the Denmark border. Our destination: a community wind farm and a solar PV plant owned by the residents of the village. Christian Carstensen, 64-year-old vice-chief of the Windpark Ellhöft GmbH & Co.KG, accompanied us to the wind farm. Christian has invested in three projects, two wind farms and a solar PV power plant. 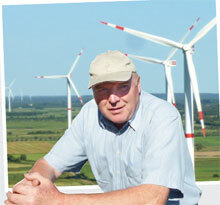 In 2000, 50 people from his village invested between €1,500 and €75,000 to install six wind turbines of 1.3 MW each. The residents contributed 20 per cent of the total capital cost of €9 million; remaining was taken as a loan from a bank. With annual power generation of 16-20 million kWh and a feed-in-tariff (FIT) of 9.1 cents per kWh assured for 20 years, their return on investment is 15-20 per cent annually. In 2012, Windpark Ellhöft paid off its loan and now the money the wind farm earns belongs to the villagers. As we climbed atop a wind turbine on a ladder, Carstensen explained how the idea is catching up. The high rate of return on investments has meant that the residents are now ploughing back money to set up new renewable energy projects. In 2010, 20 villagers came together to set up a 2 MW solar PV plant costing €5 million. This plant produces 2 million kWh of electricity each year. With assured FIT of 24 cents per kWh, the people get 12 per cent rate of return on their investments. This is lower than what they get from the wind farm, but still far higher than what they can earn from the bank deposits or share market. Inspired by the success of the Ellhöft, Danish investors from across the border have partnered with the residents to set up another wind farm of 27 MW in Ellhöft. In this project, they have installed three wind turbines of 6.125 MW capacity each—the biggest wind turbines available in the market. Money is the driving force. Investments in wind, solar and biomass projects get people higher rates of return. Regulatory certainty makes it easier for ordinary folk to invest in renewables. “In Germany, anyone can erect one or more wind turbines as long as they can fulfil the legal requirements,” explains Martin Haasler, Pastor at Christian Jensen Kolleg in Breklum who accompanied us to the wind farm. Once an area is declared suitable for wind power generation, permissions to install wind turbines come easy, though not without meeting environmental norms. Explains Carstensen, “Before constructing the wind farm we did a detailed birds and bats impact study.” His company was also asked to pay for protection of an area equal to the area of the wind farm. “For the six wind turbines we installed in 2000, we had to buy 7.6 hectares of protected area for conservation,” he adds. They were asked to do a similar study after 10 years of operation, which they have finished recently. Still Carstensen is a little worried. Last year the transmission company asked his wind farm to stop generation during peak wind season. “We cut our generation by 25 per cent because the grid did not have the capacity to transport power from our wind farm. But we got paid for the generation loss,” says Castensen. According to the German Energy Agency, Germany will have to construct 4,300 km of extra-high voltage grid until 2020 to absorb wind power generated in the north and transport it to the south. However, many grid extension projects are stalled because of local opposition and long planning and authorisation procedures. July and August are holiday months in Germany, but not for Kathleen Thompson. Her office in tiny Feldheim village in eastern Germany receives visitors from across the world all the year round. Feldheim does not have heritage buildings, restaurants or museums. What it has is a wind farm, a biogas plant and a woodchip-fired heating plant. These ensure that the village, with a population of 128 people living in 35 houses, generates all its energy locally from clean sources. It is the only village in the country with its own grid. “Feldheim showcases Germany’s Energiewende, which the world is talking about,” says Thompson, sitting inside the information centre whose walls are covered with posters advertising Feldheim’s energy ventures. Tucked away in the Brandenburg countryside 60 km from Berlin, Feldheim attracted 3,000 visitors in 2012. “The number is growing every year,” says Thompson, who is in her thirties and works for a regional non-profit, New Energie Forum. She explains how Feldheim became what it is today. Back in 2004-05 farmers in this village were a worried lot. Prices of their produce, milk, potato and sugar beet, were falling and the rate of electricity was increasing. While farmers were losing hope, a company called Energiequelle GmbH saw a big potential in the village. The Brandenburg-based company, which specialises in renewable power, was looking for a potential site for establishing a wind farm. Feldheim with an average wind speed of 6.5 m/sec fit the bill. Michael Raschermann, a 25-year-old owner of the company, sat with farmers’ cooperative and chalked out a plan to make Feldheim energy independent. A company was set up with equal partnership. It is called Feldheim Energie GmbH & Co. KG. Soon a 500 KW biogas plant was set up by the joint venture in 2008. Farmers switched to maize, sweet corn and rye. They started sending 15-20 per cent of their produce to the plant, the rest is used as animal feed or sold in the market. The agriculture feed is mixed with manure from animal farms to produce biogas. In a year the plant produces 4.2 million kWh of electricity and 4.3 million kWh equivalent of heat. Almost 80 per cent of the generated heat is used in the village, mostly in a pig farm. Its by-product slurry is used as fertiliser in farms. Meanwhile, Energiequelle also set up a wind farm with 43 turbines having a total capacity of 74 MW. 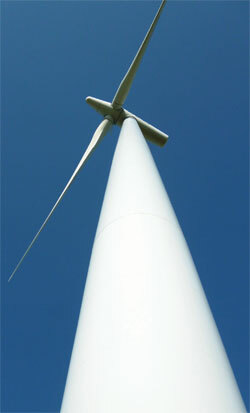 One of the turbines of 500 KW capacity is owned by the village. 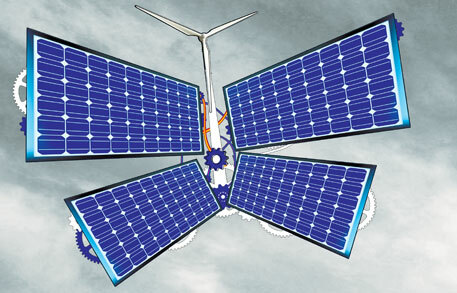 Energiequelle pays farmers rent for putting its turbines on their farms. The power generated from the biogas plant and the wind turbines is fed into the local grid to meet the electricity requirements of the village. The surplus is sold to the grid. 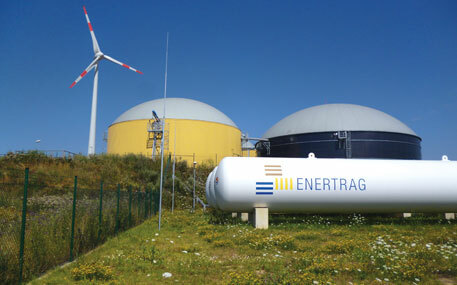 Feldheim Energie gets a feed-in-tariff of 19 euro cents per Kwh for electricity generated from the biogas plant and nine cents for the electricity from the wind farm. It sells the electricity to the residents of Feldheim at about 17 cents per kWh. But building mini-grid for the village was not easy. Michael Knappe, the outgoing mayor of Treuenbrietzen municipality, which covers Feldheim, had to face up to big energy industries. “Energy system in Germany is centralised and strictly regulated. It is also monopolised by a few energy distribution companies. And they don’t like it if somebody steps on their toes,” Knappe, a staunch supporter of renewable energy, told the media. When the residents approached the major public electricity utility E.ON, it refused to sell or lease its grid to Feldheim. “They didn’t want others to take control,” says a member of Energiequelle. The village, therefore, decided to build its own energy grid with the help of Energiequelle. It was completed in 2010. Each resident contributed around €3,000 and some state subsidies were pooled together to meet the total cost of €2.2 million. The village also received a little help (€850,000) from a European Union programme to build a heating network in the village. Having their own grid exempts residents of the village from various electricity surcharges. As a result they pay onethird lower tariff than what other households in Germany pay. This tariff is guaranteed for 10 years. In extreme winter when there is no wind, Feldheim’s wood chip plant switches on and provides heating. The biogas plant, though sluggish in cold, provides electricity. Every family in the village has found a job in these clean energy ventures. They are also earning more than before. With the number of visitors in Feldheim increasing, Thompson’s makeshift office will be replaced by a big centre which will showcase Feldheim to visitors and also conduct training for people who want to work in the renewable energy sector. It will also have a restaurant, the first in Feldheim. After taking quick strides—rather too quick—in energy transition, Germany now finds itself grappling with several challenges. Electricity prices are rising, surge in production of renewable power is disrupting energy market and grid expansion is lagging. Although Germany has been producing more energy than it requires, electricity price in the country has been increasing every year. After the Denmark residents, it is the Germans who pay the highest electricity rate (28.50 euro cents per kWh) in the European Union. This is partly because the cost of renewable energy expansion is passed on to the households and small businesses. In feed-in-tariff (FIT), the premium paid to the producer above the price on the power exchange is collected from the consumer as surcharge. So when more cheap renewable energy gets into the power exchange, the wholesale price of electricity decre ases but surcharge increases, says David Jacobs, research fellow with the Institute of Advanced Sustainability Studies in Potsdam. Over €12.5 billion (`1.09 lakh crore) are collected as renewable surcharge from German houses and businesses per year to finance FIT. The latest increase in the price of electricity by 3 cents per kWh has been the sharpest (see ‘Surcharge inflates...’). The surcharge is expected to increase from the current 5.3 cents to 6 cents in October, 2013. This would mean on an average a family will have to pay €200 more in a year,” says Fabian Joas, policy researcher with Potsdam Institute for Climate Change Research (PIK). “It could be uncomfortable for those living on social welfare,” adds Joas. Electricity price is a big agenda for the Socialist Democratic Party in Germany for the coming elections. Left parties are also asking for special tariffs for the poor. Unlike India which has a tier system for electricity tariff, Germany has a flat price for everybody. As a result even poor in Germany pay renewable surcharge. Some say funds for FIT should come from taxes so that the rich pay for the subsidy redistribution. The rising rate is also pushing industry and individuals to produce their own power but again this leaves out those too poor to afford solar panels. Eike Meyer, policy researcher with Berlin-based non-profit Green Budget Energy, says renewables should not be blamed for the price rise because conventional power also enjoys subsidy but it is not reflected in the electricity price. Thomas Hirsch of Berlin-based non-profit Bread for the World, which works on hunger and climate change, argues that price rise has not affected the people much because the share of electricity in household expenditure has been constant at 2 per cent. “Germans pay more for heating and driving than for electricity,” adds Hirch. Bernd Gurlt, who drives a taxi in Potsdam, agrees. He says it is the price of other commodities, like food, he is more worried about. He pays about €50 per month for electricity. But the prospect of a steeper rise than the current does make him a little less sure. Hungriest industry gets it free While even the poorest citizen pays the surcharge and other taxes on electricity, big industries are exempted. Energyintensive firms have to pay nominal charge for grid usage, even though they rely heavily on the grid. Besides, they are also exempted from the renewable surcharge on the ground that they have to compete in the international market. This is when the electricity rate for industry on an average is already half of what a household pays. The association of energy and water companies, BDEW, says it is just 4 per cent of firms that get exemptions on the ground of international competition. But it is these 4 per cent that consume a fifth of the energy supplied in Germany. An increasing number of companies are asking for exemptions. These include public transport and bottled water companies that have no international competitors. The exemptions are counterproductive to efficiency, says Patrick Graichen of policy think tank Agora Energiewende. At present, companies consuming beyond a certain amount of electricity are exempted from the grid surcharge. If these industries bring down consumption they will lose the incentive. Noticing this cross subsidy, the European Commission in July launched a probe into the legality of exemptions. According to some media reports, the exemptions granted to the energyintensive industry amounted to €300 million last year. Sources close to the government say the probe was postponed till the elections after Chancellor Angela Merkel intervened. The country’s changing energy mix and increasing production of solar and wind power have disrupted the energy market. The market assigns preference for energy from the cheapest source. The plant with the lowest operating cost-mostly decided by the fuel cost—gets the first purchase preference. Since operating cost is negligible in case of wind and solar energy, it is bought first, followed by power from hydro, nuclear, lignite, coal and gas. The operating cost of the last most expensive plant needed to cover the demand sets the electricity price in the energy market. This is called the marginal price. Since renewable energy is increasingly meeting a good part of the demand, expensive coal and gas power gets little chance to be sold. This is bringing down the wholesale price. Overproduc tion of solar energy, especially between 11 am and 2 pm, leads to a sharp fall in electricity price in the spot market (see ‘Renewables displace...’ on p38). This is giving a hard time to the producers of conventional power. “In this changing system, running conventional power plants is increasingly getting uneconomical,” says Volker Holt - frerich, unit manager of BDEW. Many industry players are threatening to shut shop and move to other countries. Noise made by threatened conventional power plants has initiated a debate on market reform in government circles. Industry and some economists are arguing that the existing system cannot guarantee reliable power. Their point is that during the sunless and windless days one needs conventional energy, so conventional power plants should remain in business. What Germany needs is flexible power plants, which one can start and stop depending upon the demand. “A reservoir of adequate conventional power capacities is needed to provide a flexible and reliable system,” says Holtfrerich. Ensuring system reliability or keeping a backup capacity is not just desirable but of special importance to Germany because it is likely to face a shortfall in uninterrupted power, according to a recent report by Agora Energiewende. The country’s decision to phase out nuclear power will eliminate 4-gigawatt (GW) capacity between 2015 and 2019 and another 8 GW by 2022, states the report. Though around 2.7 GW of lignite-based capacity became operational in 2012 and about 8 GW of new coal capacity is expected to be commissioned by 2015, no new coalbased power plant is likely to be built given the current scenario. So how can Germany ensure a reliable power system without hurting renewables? Industry’s answer is it be paid incentives for having capacity. “And the plants can be brought to life whenever demand arises,” suggests Jurgen Weigt, senior policy officer at German Association of Local Utilities, Berlin. Graichen estimates giving capacity incentives to the coal and gas-fired plants will require €4 billion. Agora’s report points out that the existing conventional power system is, however, not able to make rapid adjustments like being able to start and shut down quickly. They need to be modified for flexibility. German electricity networks are still the most reliable in Europe, with German consumers experiencing only 15 minutes of electricity disruption in a year. Contrary to the popular perception, renewable energy has so far not made the grid unmanageable. But the need for grid upgradation is now being felt. Since most of the renewable energy generation, especially wind, is spread over large areas far from demand centres, expansion of the grid is necessary. The grid between north and south Germany is not capable of carrying the electricity generated by the windiest north to south and south west where most of the industry is located. So when there is overproduction, some plants are asked to shut down or wind energy is pushed into other countries—Poland and Czech Republic on the east and the Netherlands on the west. The German grid consists of 35,000 km of ultra-high-voltage transmission lines plus 80,000 km of high-voltage lines, which were built for conventional power. But most of the renewable energy projects produce low-voltage electricity, therefore, modernisation of lowvoltage distribution grid is also required, especially to become bi-directional to accommodate households selling electricity to the grid, as well as buying from it. According to official estimates, the country will need an additional 4,500 km of high-voltage line by 2020 but could manage only 214 km by 2012. This is largely due to opposition from the communities who do not want transmission grid in their backyards. An alternative to the grid is storage but it is expensive due to efficiency losses. In fact, a big argument in Germany is whether to consume the energy where it is generated or build an intensive network for widespread grid distribution across Germany and the European Union. Most energy experts are in favour of developing different areas based on their local potential rather than concentrating generation capacity in resource-rich regions—wind in the north and solar in the south. This way more renewable energy can be fed into the grid and consumed locally, says Hirsch. Building a strong grid network will also help stabilise electricity prices. By 2020, Germany will produce about twice the amount of electricity from wind and sun as the rest of the EU. “The increasing overproduction of renewable energy will continue to drive down price in the spot market. When this happens, demand from neighbouring countries can be used to stabilise prices and conversely when wind and sun are weak, energy from neighbouring states can flow into Germany and dampen the high market price,” says Graichen. For example, Scandi navian countries have a large amount of hydroelectric power and storage. When cheap electricity is available in Germany they can stop their production or store the power. Graichen says it is estimated that the extra grids in Germany will cost 0.3-0.4 cent to transport 1 kWh. In contrast, new storage technologies cost 15-20 cents to store the same amount of electricity. Thus, building grids is cheaper. It will not completely rule out the necessity for storage but reduce it greatly. Integration of energy systems is, however, not going to be easy. Poland has started putting barriers on transmission grids over a certain capacity to block cheap electricity from Germany that is putting their gas and coal plants out of business. To meet these challenges Germany needs to reform energy infrastructure, pricing mechanism and energy market. Liberal economics minister Philipp Rösler early this year called for a fundamental reform of the Renewable Energy Sources Act (EEG) and urged the government to rein in spiraling electricity prices before the September election. His demand was supported by environment minister Peter Altmaier who proposed cuts in FIT in June. 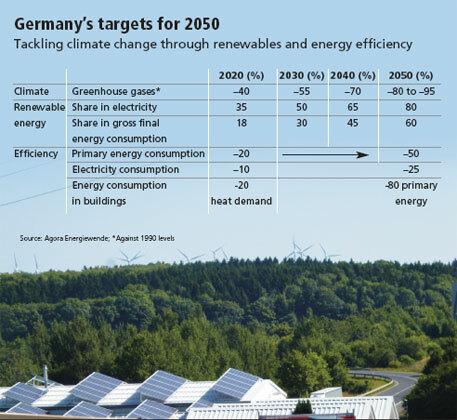 Germany’s energiewende is influenced by its climate policy. Critics say Germany is going ahead without a proper plan. For example, a lot of solar PV was allowed when prices were very high. 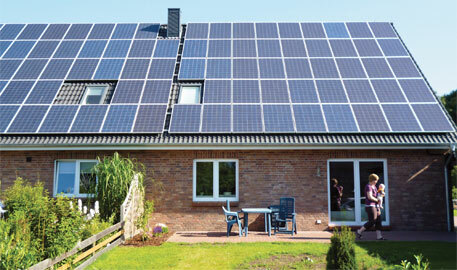 People who put up PV in their fields and on roofs made a lot of money with 20 years’ guarantee. “PV was a money printing machine,” says Joas. Critics say that even when the PV prices were falling and demand to reduce FIT was pouring in from nonprofits and policy analysts, the government paid no attention. The reason was political. States in Germany have a huge influence in Parliament. And people who put up solar panels on their roofs constitute a strong vote bank for local leaders. It was only last year and then in April this year that the government cut FIT drastically. Critics say the measure came late. According to a recent McKinsey report, renewable subsidies will rise from the current €13.5 billion a year to €15 billion in 2015. But Germany continues with the expensive energy transition which is now being seen in its commitment to develop off shore wind capacity. It aims to build 10 GW of off shore wind by 2020 from the current 270 MW. For Germany off shore means at least 50 km off the shore because it does not want to spoil its scenic beauty. The farther the wind mills from the shore, the more expensive the installation. FIT for off shore would also be double than that for on shore wind energy. One way to incentivise rene wable energy while reducing its cost progressively is to develop a mechanism for an auctioning scheme in which renewable power producers bid for a given capacity and the lowest bidder gets the contract, something like what India has done. This would also help in reducing the electricity price, says Joas. Why has Germany chosen this expensive way to check climate change? The most pronounced hypothesis is that this way Germany can demonstrate to the world that decarbonisation of the electricity sector is possible through renewable energy and demand side management. Germany wants to be seen as a leader and secure a future business. So when, in the future, nations would be desperate for quick answers to climate change, it would be ready with its strong technology base and expertise in renewable energy to become a technology provider. “It is costly now but will save more than it costs after sometime between 2025 and 2040. The reason is that the fossil fuel-based energy system would also need high investments to replace or rebuild obsolete infrastructure, which will be saved by a combination of very cost-effective energy efficiency and renewable energy that has high upfront costs but very small operating costs,” says Stefan Thomas, director of the Research Group Energy, Transport and Climate Policy at the Wuppertal Institute of Climate, Environment and Energy. I heard about energiewende about two years ago when a German friend told me about the ambitious goal that his country had announced for renewable energy, energy efficiency and greenhouse gas (GHG) emissions reduction. It did not excite me much mainly because till then the outcomes were modest: the share of renewable energy in the electricity mix was only 15-16 per cent, which was similar to India’s, and there was a question mark on achievements in sectors like transport and industry. Although Germany had reduced its GHG emissions more than it had to under the Kyoto protocol, it could do so because of the reunification wherein a number of inefficient industrial units in the erstwhile East Germany were closed down. For me, then, energiewende was no different from what many developed countries had put out as their emissions reductions targets for 2050 under the Cancun agreement—big numbers, but little to show. As the noise around energiewende grew louder, so did my interest. The turning point for me was a newspaper article that reported how power companies were threatening to shut down their coal and gas plants because renewable energy was making them unviable. We decided to go and see for ourselves what this energy transition was all about. For 10 days we criss-crossed Germany—from Heidelberg and Frankfurt in the centre to Breklum in the north to Feldheim and Schenkenberg in the east. The more we travelled the more excited we got. Germany’s energiewende was opening our eyes to a new energy future. Sure we found problems and challenges; but we also saw commitment, achievements and innovation. Most importantly, across the political and economic spectrum, we found people supporting this transition. In the past 10 years, Germany has done remarkably well in the renewable electricity sector. Today its installed capacity of renewable electricity is almost equal to that of fossil fuels—about 80 gigawatts each. In the first seven months of 2013, 15.5 per cent of the electricity generated in Germany came from just solar photovoltaics and wind power. This is a record in the world. In June this year, when the weather was moderately windy but the sun was shining bright, a record 7.7 Terawatt hour or 22.5 per cent of the total electricity was produced by wind and solar plants—again a record. On July 7, when the mercury crossed 35°C in most parts of Germany, between 10 am and 4 pm, the 1.3 million solar power plants, installed on houses, commercial buildings and farms, collectively met half the electricity demand—yet another record. Renewable power is, therefore, real in Germany. But not all is well with energiewende. There are major challenges in sustaining and upscaling renewable power in coming years without disrupting the electricity supply. The current market design, though favourable for renewable energy that is enjoying assured feed-in-tariff, is creating major problems for the conventional power plants who have to either shut down or sell their power free during peak solar and wind periods. It is also not sustainable for the solar and wind energy producers in the long run. During peak wind and solar period, so much electricity is produced at nearzero cost that the wholesale price of electricity dips significantly. As a consequence, wind and PV destroy their own prices at the wholesale spot market. Without feed-in-tariff they will not be able to earn enough revenue because the price will always be lower than the market price average whenever they will produce electricity. Thus, Germany will need major reforms in pricing electricity from renewables. There are proposals on the table that advocate moving from “energy only market” to “energy, investment and storage” market. In the proposed market, the electricity producers will not only be paid for electricity, but also for capacity—for conventional power plants to remain available when required and for wind and solar plants to recover their investments. Businesses will also be paid to store electricity and feed it to the grid when required. But electricity in this market will not be cheap. And the future market will have to be far more regulated than today. Energiewende also suffers from skewed focus. Discussions are largely focussed on electricity and supply side management, not on heat energy and demand side management. In a typical German household 75 per cent of the energy is consumed for heating and 25 per cent is used in the form of electricity. The heating energy is largely supplied by natural gas and fuel oil. So the spotlight on renewable power is actually taking away the focus from reducing heating energy. There is a lot of criticism within Germany on the energy efficiency front. In January last year, around 30 energy economists of Germany wrote an open letter to Chancellor Angela Merkel and Parliament, complaining that the country is not doing enough to increase energy efficiency of buildings and industry. Some experts even believe that Germany is likely to miss its energy efficiency targets for 2020 because of its lopsided focus of energiewende on renewable power. Germany faces challenges in the mobility sector as well. It has one of the highest car ownership rates in the world. Fossil fuel consumption in cars, which the Germans love to drive, is not reducing and the targets that Germany has set to have one million electric vehicles and 20 per cent biofuels mixed in its automobile fuels by 2020, are not likely to be met in the current scenario. At present, only 5.25 per cent of the auto fuels used in Germany are biofuels, mainly ethanol and biodiesel. Considering immense pressure on land and conflicts with food production, Germany is now importing palm oil from Malaysia and Indonesia to make biofuels. But certifying imported palm oil’s carbon emissions savings is an elaborate process that experts are questioning. They are asking for more money to be put on third-generation biofuels, based on algae, and on public transport. Electric vehicles are finding very few takers. 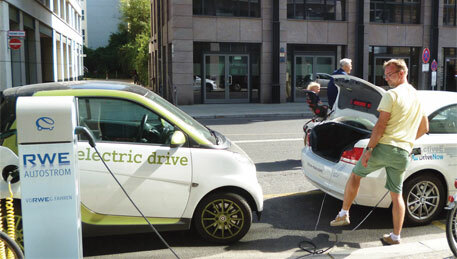 At present, Germany has only 7,000 registered electric vehicles and many experts believe that meeting 1 million vehicles target will not be possible unless the driving range of these vehicles are improved and Germany offers more incentives. There is also an element of social inequality in energiewende, which is now being voiced by the left political parties and some Green party politicians. In the coming elections this is going to be an important issue. Even with all the challenges and problems, German energiewende is the most ambitious venture to decarbonise an economy. No other country even comes closer. Germany is showing to the world that a completely new energy system based largely on renewables is possible. In this energy system, the majority of energy demand—electricity, heating and for mobility—will be met from renewable sources. The “base load” fossil fuel power plants that dominate our lives will disappear. What we will have instead is flexible fossil fuel plants that will operate only when required. To maximise on renewable potentials in different countries, we will have regional grids to import and export renewable power. Renewable energy will be stored in pump storage dams and in the form of electricity and hydrogen. The stored energy will supplement the peak demand. The German model also fosters a new energy market dynamics in which the small players win. Germany’s wind and solar transition is not being propelled by large utilities and big companies. It is being led, owned and operated by citizens, small utilities and energy cooperatives. This points towards a decentralised energy future in which millions of people, small businesses and cooperatives will produce electricity, consume it locally and feed the surplus to the grid. With a little more advancement in grid and energy storage technology, this future is possible, too. It is important to understand that Germany gets far less sun compare to countries like the US, Australia, India, China and most parts of Latin America and Africa. If Germany can produce such large amounts of solar power with so little sun, then we need not worry about the renewable electricity future. But Germany has been able to do all this because it could afford it. For developing countries like India, financing such a massive venture on their own would not be possible. This is why a global mechanism is required to share the burden of transition to the renewable energy future. Will Germany be able to solve all problems and meet challenges that energiewende has thrown up? Can it meet all its targets? I believe, it can and it will. The exciting thing about energiewende is not how much renewable energy Germany has installed so far, but how the German government, businesses and civil society are thinking about the energy transition. I believe the German society has crossed the hump. Excellent article. Yes. Germany is advancing in leaps and bounds in Renewables. The fact that Germany once a Nuclear country chose to switch over to Renewables is a lesson for other countries to follow. Excellent story. It was mentioned in the article about Ellhoft: electrifying cooperatives. The expansion of renewable energies leads to fundamental changes concerning our energy supply. Wind turbines in the landscape, photovoltaic systems on roofs or farms with biogas plants are visible indications for the development in that sector. Heat pumps, wood pellet and woodchip heating plants provide heat and relieve whole villages from fossil fuels. Renewable energies do not only protect the climate, but also improve the security of supply, create new jobs and increase the regional income. The decentralized nature of renewable energy gives every citizen the opportunity to make an active contribution to the transformation of energy supply, either by building their own facilities or by participating in community projects. In the last three decades, people came together in numerous citizensÃ”Ã‡Ã– groups, local councils and regional businesses to establish common renewable energy projects in their region. Energy cooperatives as organisational form are growing a lot in popularity because they offer a variety of possibilities for action and design. Currently, more than 80,000 citizens in Germany hold shares in new energy cooperatives. They can already participate with small amounts. In the last years, more than 500 newly-founded energy cooperatives invested a total of 800 million euros in renewable energy. This is confirmed by a recent study of the DGRV( SourceDGRV). The move away from conventional sources of energy in Germany is driven primarily by citizens. An increasing number of people work together by forming cooperatives to build wind farms and solar plants. Cooperatives have experienced a revival in Germany. In 2006, eight new energy cooperatives were founded. In 2011 alone, this number was 167. And the German Cooperative and Raiffeisen Confederation expects the figure to be even higher for 2012. This kind of growth is vital if Germany wants to phase out its nuclear energy dependency by 2022. By promoting energy policy at the local level, communities all over Germany are profiting from renewable energy sources and the power of cooperatives. A typical example of this growth is seen in the Horb Ecumenical Energy Cooperative in Stuttgart, which has implemented several solar power plants. Bernard Bok was a driving force in this task: before his retirement he was on the board of the local cooperative Volksbank, so he was interested in helping the cooperative. For him there was no question, the development of renewable energy needed the strong legs of a cooperative to stand on. Ã”Ã‡Â£We are in a country of cooperatives,Ã”Ã‡Ã˜ said Bok. Nowhere in Germany are cooperatives represented more strongly than in southern German. Small-scale farming was expected to expand so local farmers organized themselves into agricultural cooperatives. In the mid 19th century, cooperative were born out of necessity. But today, people come together for different reasons: the desire for self-government and citizen participation is growing stronger. People are looking for an alternative to unknown investors and prefer to follow their own agenda istead of being dependent on others. Thus, in times of global economic turmoil, local communities and civil societies are a deliberate counterpoint to the international financial markets. Often traditional cooperative banks, such as the Volks- and Raiffeisenbank, participate in the funding and financing of local cooperatives. The range of energy cooperatives is large, and it is not limited to just solar or wind power. For example, a cooperative in the community of St. Peter in the Black Forest last year built a plant for local thermal power. A modern wood heating plant provides heat for the town of 150 houses, which have made oil heaters obsolete. About 8,500 meters of piping were laid in the village for the cooperative. To complete the project, different stakeholders came together from over the region each bringing their own specific professional knowledge. Markus Bohnert, a board member of the citizens cooperative, has worked as a forester. Other supporters had backgrounds in heating construction, building design or marketing. The idea for this cooperative started in 2007. A subsequent survey of all citizens of St. Peter showed that people were very receptive. Above all, the major local consumers wanted to be a part of the project including municipal buildings, church facilities, as well as many hotels and restaurants it the town center. As a result, "People's Energy of St. Peter" was founded. The number of people required to found a cooperative has dropped from seven to three people. Similarly, the required number of board members was reduced for small cooperatives. With these changes, cooperatives have been gaining speed: According to the umbrella organization for cooperatives in Baden-Wâ”œâ•rttemberg, southern Germany, one in three citizens are a member of a cooperative( Source: Energy Cooperatives are booming in Germany,DW). The use of the offshore wind energy in German waters predominantly takes place outside the 12 sea mile zone in the exclusive economic zone (EEZ). With this, the majority of the planned projects and those still in operation is located in the high seas of the German North and Baltic Sea. At the end of August 2013, 520 MW of offshore wind capacity was being connected to the grid in Germany. By 2030, a capacity of 25,000 MW is to be connected to the grid according to the plans of the Federal Government. Currently, offshore wind farms (OWP) with a total capacity of about 1,600 MW are being constructed; wind farms with a capacity of 9,000 to around 10,500 MW received an authorization. Moreover, further 94 projects with about 6,600 Off WEA and a total capacity of up to about 30,000 MW are in the process of authorization so that all in all, about 40,000 MW are in the planning stage (as at September 2012). The maps of the German North and Baltic Sea provide an overview of both the location and the status of the projects(Source:OFFSHORE - WINDENERGIE.NET). I have been advocating starting Wind Farm co-operatives in India on the lines of those in Germany,Denmark etc. for over a decade. Hitherto Depreciation benefits were goiven to large industries. A WIND FUND can be created and people( Individual Tax Payers) can be exempted if they invest in this Wind fund under Section 80C. This way there will be wide participation of People in Wind Farms. Another area that needs immediate attention is Offshore Wind Farms. I had been suggesting Offshore Wind Farms since India has long coast line. Winds in the sea are about 30% more than on land and since Power is cube of velocity,offshore wind farms give higher yields.Atleast a Pilot Project can be started by MNRE so that Private Industry follows. Excellent article. I especially appreciate the detailed coverage of small communities establishing their own energy supply and generating income from supplying energy to the grid. we need more examples of this so that many other communities around the world can start similar initiatives or encourage their legislative bodies to promote this as Germany has. Germany's renewable energy sector is among the most innovative and successful worldwide. 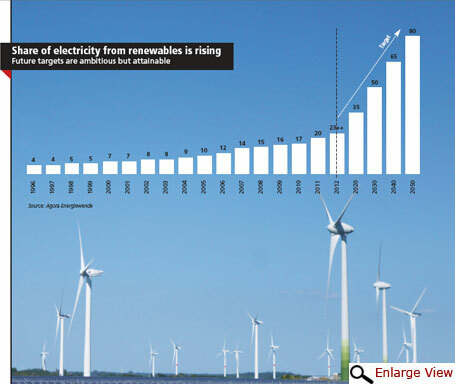 The share of electricity produced from renewable energy in Germany has increased from 6.3 percent of the national total in 2000 to about 25 percent in the first half of 2012. In 2011 20.5% (123.5 TWh) of Germany's electricity supply (603 TWH) was produced from renewable energy sources, more than the 2010 contribution of gas-fired power plants. According to official figures, some 370,000 people in Germany were employed in the renewable energy sector in 2010, especially in small and medium sized companies. This is an increase of around 8 percent compared to 2009 (around 339,500 jobs), and well over twice the number of jobs in 2004 (160,500). About two-thirds of these jobs are attributed to the Renewable Energy Sources Act Germany has been called "the world's first major renewable energy economy"
Germany's renewable energy sector is among the most innovative and successful worldwide. Nordex, Repower, Fuhrlâ”œÃ±nder and Enercon are wind power companies based in Germany. SolarWorld, Q-Cells and Conergy are solar power companies based in Germany. These companies dominate the world market. Every third solar panel and every second wind rotor is made in Germany, and German turbines and generators used in hydro energy generation are among the most popular worldwide. Siemens chief executive, Peter Lâ”œÃ‚scher believes that GermanyÃ”Ã‡Ã–s target of generating 35 per cent of its energy from renewables by 2020 is achievable Ã”Ã‡Ã´ and, most probably, profitable for EuropeÃ”Ã‡Ã–s largest engineering company. Its Ã”Ã‡Â£environmental solutionsÃ”Ã‡Ã˜ portfolio, which is firmly focused on renewables, is Ã”Ã‡Â£already generating more than Ã”Ã©Â¼27 billion a year, 35 per cent of SiemensÃ”Ã‡Ã– total revenue, and the plan is to grow this to Ã”Ã©Â¼40 billion by 2015Ã”Ã‡Ã˜. Ending its involvement in nuclear industry will boost the credibility of Siemens as a purveyor of Ã”Ã‡Â£green technologyÃ”Ã‡Ã˜. Germany's main competitors in solar electricity are Japan, the US and China. In the wind industry it is Denmark, Spain US and the China. Source: Bâ”œÃ‚hme, Dieter (February 2013). "Entwicklung der erneuerbaren Energien in Deutschland im Jahr 2012"(PDF). Federal Ministry for Environment, Nature Conservation and Nuclear Safety. Retrieved 20 April 2013. Indeed Germany has shown the path for a gradual transition from Conventional Energy to Renewable Energy and it is hoped other countries will follow the fine Example of Germany. A very thorough and well-researched article! It is right that the Energiewende is quite expensive, but on the other hand the Germans are strongly against nuclear power and more than happy to get rid of it. The other thing is that we don't have a lot of fossil resources. We buy gas from Russia and coal from China and India, so it seems like a sensible thing to use renewable sources to become more independent. People aren't buying electric cars just yet, but that will be the next step: To fuel cars with electricity from renewable sources. This will keep the automobile industry going (sadly that is the most important thing in Germany), but it will also reduce pollution and the need for oil. What is the source/reference used for the figure of 1.3 million households using solar PV? I have been unable to find this exact data anywhere else online.